Pico, the Chocopic dog wears a yellow shirt and loves this round chocolate wafer-like cereal. The Golden Grahams Bear wears a white t-shirt as he watches over his cereal. CiniMini Baker (1997) overlooking his handiwork. He is known as Le Petit Pâtissier in France. Estrellitas Spacedog (1998) zaps his cereal stars. Nestle NesQuik featuring Quicki, the Nestle Quik Rabbit was introduced in Spain in 1998 and became available in the USA in 1999. It's a chocolatey rice and corn puff cereal that turns your milk Nesquik Chocolatey. Le Requin Kix (The Kix Shark) also known as "Sharky" wears glasses, a white dress shirt with red vest, striped pants, and red sneakers. Klondike Pete (1999) and his mule sidekick Pardner (1999) have once again stuck gold! Klondike Pete was previously seen 25 years ago on boxes of Nabisco's Klondike Pete's Crunchy Nuggets. The old prospector has been on a 20-year nugget hunt and has located the motherlode in a new secret mine. Plum Loco Louie and Boot Hill Bob (aka The Breakfast Bandits) are two desperados who would like to get their hands on the "delicious boulders of wheat and honey." The characters also include a Golden Nuggets Bee. The box itself is filled with wonderful animation --- the way a great character box should be! Art by Gary Dunn. Donald Duck, and his nephews: Huey, Dewey, and Louie appeared on boxes of Trio. Koko the Koala Bear had his own organic cocoa cereal. The cool Snow Flakes Polar Bear graced boxes in Eastern Europe. Kangus, was an aviation-hat-wearing kangaroo. Russian Trumpeter blasts out a Russian words on this Eastern Europe Cheerios box. Note: National Biscuit Company changed its name to Nabisco in 1971. Shreadded Wheat, was sold to Post along with trademark rights. Nabisco still makes the hot cereals Cream of Wheat line. Ranger Joe (1939) may have been the first presweetened "sugar coated" cereal. They encouraged you to eat this cereal like a sweetened snack right out of the box. Renamed Wheat Honey's in 1954 when Ranger Joe was replaced by Buffalo Bee. Listen to Straight Arrow the Indian (1949-1952), and buy National Biscuit Company's Shredded Wheat cereal. Howard Culver played Straight Arrow on the Mutual network. Buffalo Bee, a bee in cowboyoy hat and a pair of six-shooters, replaced Ranger Joe on boxes of Wheat Honeys in 1954 and stayed into the 1960's. "I'm Buffalo Bee, Take my advice, Get Nabisco Wheat Honey's, Also Rice". (Although the image of Ranger Joe was dropped in 1954, the cereal was still known as "Ranger Joe" Rice and Wheat Honeys through 1955). The Honey Wheats 1958 slogan went like this: "I'm Buffalo Bee. Take my advice. Get Nabisco Wheat Honey's. Also Rice." Buddy Bee promoted both Wheat and Rice Honeys from 1965 to 1969. The Yellow Submarine was featured on both Wheat Honeys and Rice Honeys in 1969. Munchy (the commanding officer up in front) had three rows of buttons, Crunchy (the guy in the middle) had only two rows of buttons, and Spoon-size (the little guy in the back) had one row of buttons. Collectively they were known as the cool Spoonmen who graced the boxes of Shredded Wheat Juniors (the original spoon-size biscuits) from 1958 to 1960. Astronaut and space explorer, Major Matt Mason could be found on boxes of this "nourishing whole wheat cereal". Winnie-the-Pooh (1972/1973) is bear of very little brain and is fond of honey. "We have the hunch...You'll love to munch... Great Honey Crunchers...Cereal from Nabisco." (This cereal was actually Wheat and Rice Honey's under a new name). Here is a complete profile on Winnie-the-Pooh and friends. Rastus, the Cream of Wheat Chef, wears a white chef's uniform and hat. "Eat while the iron is hot". Daisy and Li'l Abner (1952), from comic strip fame. Puppet's (owned by Nabisco) cereal containers were produced in 1966 in the shape of Winnie-the-Pooh, Kanga and Roo, Mickey Mouse and Donald Duck. This container is in the shape of Kanga, with a little molded Roo in his pouch (hard to see in the image above). Kanga, of course, is the only female character with a speaking part in the popular Winnie-the-Pooh books by A.A. Milne. Find out more about Kanga, Roo, and the whole gang at Christopher Robin's "Winnie-the-Pooh Character Guide"
Klondike Pete (1972/1974), sort of a Ranger Joe reincarnation, was a crazy cliff-hanger. Pete and Thorndike, his mule, set out to strike gold and found it in Crunchy Nuggets, a wheat-based cereal. (I love these characters!) Another character named Mexican Mike, complete with sinister mustache, attempted to steal Crunchy Nuggets from Pete and Thorndike. Animated by Dean Yeagle. Voice by Barnard Hughes. 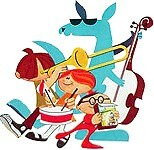 Blue Kangaroo (1972) was a hip character who wore sunglasses while representing the blueberry cereal. "I'm a blue kangaroo, how do you do? I got a new cereal, called Ooobopperoos". We do not know if this is the same character who also appeared on boxes of Sweet Wheats. Blue Roo (1971 - 1973?) was a hip sunglass wearing, bass playing, blue kangaroo. Millie is the drum-playing girl, Big Boo plays trombone, while Willie the Kid just plays. Sweet Wheats were simply "sugar frosted frosty bits of shredded wheat cereal". Norman had his own cereal in 1972. As you can see, Norman looks a lot like GROG from the comic strip B.C., except that Norman has arms and wears sneakers. A boy and a girl with ice cream cones represented Rice Cream Flakes, rice flakes coated with freeze-dried vanilla ice cream. (Do not confuse with "Ice Cream Jones"). Teddy Grahams Breakfast Bears Graham Cereal (1990) featured the Teddy Graham Bears that are more commonly associated with Teddy Graham snacks. 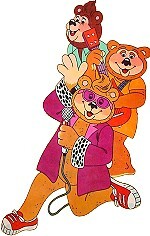 The three bears were a band. The cereal came in three varieties: Honey, Cinnamon, and Chocolate. All were graham cereals stamped in the shape of a small teddy bear. Disclaimer: This is a non-commercial site with the sole purpose of assisting visitors in locating information on their favorite breakfast cereal characters. All of the names, characters, brands, and icons listed here are trademarks of Nestle &amp; Nabisco or their respective parent companies and cannot be used for commercial purposes. Enjoy Nestle &amp; Nabisco cereals and support your favorite characters!